A Visual Studio extension that installs a short list of highly valuable extensions targeted web development. It doesn't take long to install the extensions. Probably less than a minute. When installation is done you will be prompted to restart Visual Studio. After the restart, all the extensions are fully functional and ready to use. 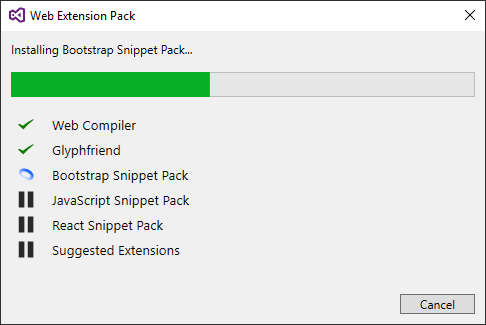 If you've uninstalled any of the extensions installed by Web Extension Pack, then those extensions won't be installed again automatically.